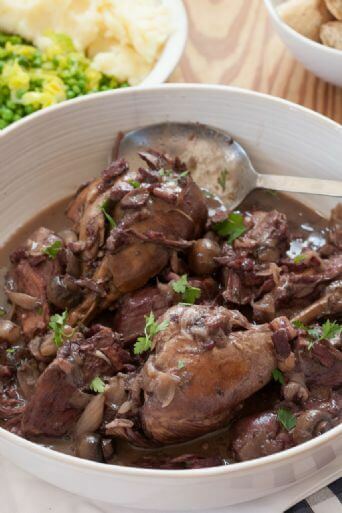 Coq Au Vin | Packington Free Range | Born and reared outdoors. Always. 1. In a large casserole dish fry the shallots in the olive oil – after 5 minutes add the lardons. 2. Once the lardons have browned add the cockerel (or chicken) and crushed garlic cloves and brown the meat. 3. Add the flour and cook for a further 2 minutes. 4. Pour in the wine and stock and bring to the boilAdd the bouquet garnet and season – bring to the boil then reduce to a simmer. 5. Simmer for 1 hour 20 – 1 hour 30 – adding the button mushrooms for the last 30 minutes – until the sauce has thickened.